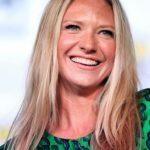 Anna Torv is an Australian actress known for her role as FBI agent Olivia Dunham on the Fox television series Fringe (2008–2013). "With science fiction there’s endless possibilities." "I’m terrible at practical jokes. I do them too well, so they’re not funny. I end up saying, ‘Oh, no, I’m joking, I’m joking.’"
"My friends and I would get up early and take our horses through the national forest. My mom was very free. It was always ‘Out of the house!’ There was no watching television on weekends." "Everybody’s funny if you love them." "Shakespeare is all big themes, like the most amazing love, or the most scary war." "Science fiction is becoming more of a diverse kind of genre."